Online educational opportunities can make learning a fun and rewarding adventure. However, there is a danger looming behind the flexibility of the online environment: procrastination. You constantly tell yourself there is enough time to study tomorrow, and consequently you don't manage to achieve the planned results. 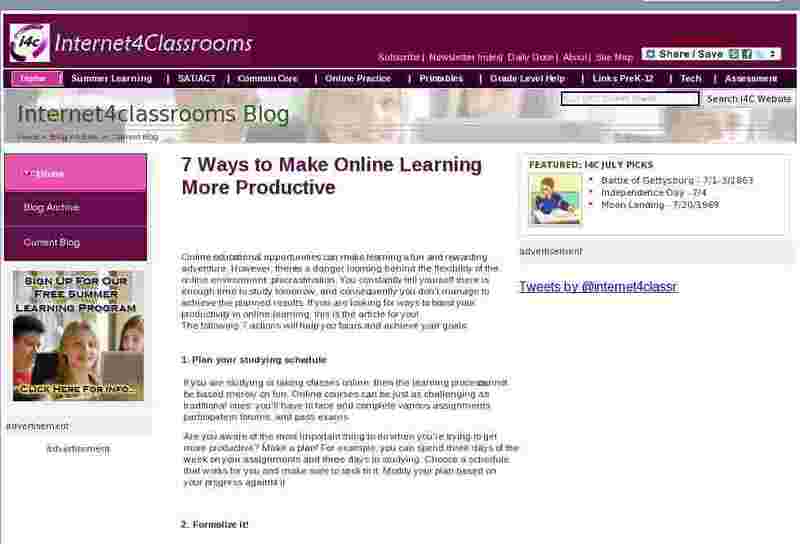 If you are looking for ways to boost your productivity in online learning, this is the article for you! If you are studying or taking classes online, then the learning process cannot be based merely on fun. Online courses can be just as challenging as traditional ones: you'll have to face and complete various assignments, participate in forums, and pass exams. Are you aware of the most important thing to do when you're trying to get more productive? Make a plan! For example, you can spend three days of the week on your assignments and three days in studying. Choose a schedule that works for you and make sure to stick to it. Modify your plan based on your progress against it. No one will take your online learning adventure seriously if you don't get serious about it first. Although online learning allows a certain degree of flexibility, gamification and fun, it still requires a formal approach. Most online classes have a proper schedule, coursework materials, specific assignments and tests. The main difference is the setting - you access these materials from your home. Set the right environment - Formalize it. And don't get too comfortable: A relaxed reading session on your couch won't deliver the desired results. Instead create an environment that enables you to focus. Arrange your desk with the materials you need, isolate yourself for few hours per day and make a commitment to the plan you've created. When you're in an actual classroom, you wouldn't accept a phone call from your friend during the professor's lecture, would you? Online learning shouldn't be different. Don't allow yourself to be distracted by social media, phone calls, guests, or anything else when you're listening to an online lecture, completing an assignment or studying for a test. You are allowed to take short breaks in between sessions of activity. Use that time to send emails, check social media updates, read the news, have a coffee, or do anything else that makes you happy. After your break you'll need to get rid of all those distractions and return to studying. Online instructors want students to be engaged with the instructor as much as possible during the learning process. Use this opportunity! Connect with your course instructors or online tutors and ask any questions you might have. Of course, you need to think about your questions before posting them. Were they already answered? Be concise and check your sentences before submitting them. You don't want to look silly because of improper grammar. Don't neglect the opportunity to become part of an online community that will help you make progress as a student. You should connect with other students in your classes and learn from each other. Everyone uses different applications, online tools and methods that help them study more productively. When you engage in such a community, you will benefit from the collective experience. Don't be afraid of team projects; Take advantage of apps and other collaboration tools that will make the process more fun than you might expect. 6. Learn how to conduct thorough and comprehensive research! The fact that you're an online student doesn't allow you to base your projects on the first page of Google results. Yes, you can definitely use the Internet when conducting research, but you need to evaluate the reliability of each source before you decide to use it. Wikipedia and other submission-based sites are not considered to always be trustworthy sources, so avoid them when possible in favor of more reliable sources. StudyBlue - an online service that enables you to access quizzes, review sheets, flashcards, study guides, and other materials that will save you a lot of time. You don't have to create your own flashcards when you can start learning immediately from the ones located at this website. FunBrain - a website that helps online students become more productive by gamifying the learning process. Quizlet - an online destination where you can find tests, flashcards, and study games that add some fun into the learning process. Students of all ages can find the materials they need at Quizlet. Studygs.net - a service that offers resources in writing, reading/research, testing, memorizing, time/project management, and much more. If you want to discover the most effective ways to learn without direct guidance of a professor, this is the right website for you. Guest writer: Julie Petersen is a tutor, writer and a blogger, who features the latest career and educational trends in her articles. At present time she is running her essay writing blog AskPetersen.com, working as a blog editor at Essaymama writing agency and writing her first ebook dedicated to online learning. You may see Julie's latest publications and contact her via Linkedin.